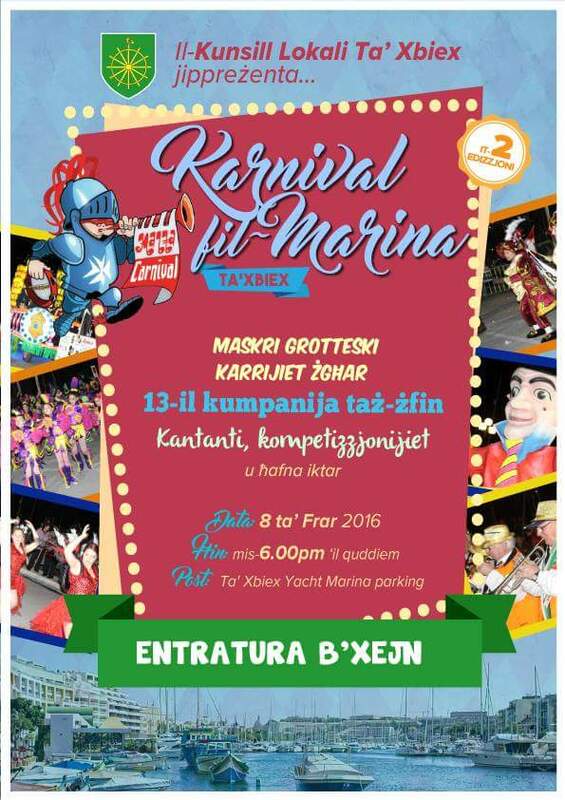 Malta Carnival 2016 will be held from Thursday 5th February to 9th February. This post will be updated with results and new photos from this year’s Malta Carnival. Opening Ceremony of Malta Carnival 2016 activities at Pjazza Teatru Rjal, Valletta. Costume Parade along Republic Street, Valletta followed by Dancing Competitons in St George’s Square and carnival défilé consisting of the King Carnival float, Valletta 18 float, satiric floats and Section A Companies in Costumes on Floats. Children’s Carnival at St. George’s Square, Valletta. Dancing Competition together with the Grand Défilé performance at St George’s Square, Valletta. Various activities will be held in Valletta. This will include the Qarcilla event in St John’s Square, Valletta. Carnival Band Parade in High Street, Hamrun. Carnival Floats Parade at Castille Place, Valletta. Parade will proceed along Merchants Street to St. George’s Square and then along Republic Street. Special Sunday afternoon Carnival Grand Show at St. George’s Square, Valletta. Dancing Schools Carnival Parade followed by a Dancing Show at St George’s Square, Valletta. Dancing Competition Programme followed by the Grand Défilé at St George’s Square, Valletta. Qarcilla event at Fort St Angelo in Birgu. Dancing Schools Carnival Parade followed by a Dancing Show at Pjazza Teatru Rjal, Valletta. Grand Finale in St Anne’s Street with the participation of Carnival Bands, floats and general merriment. The televoting prize was won by “Hatfuni u nkaljajna, biex taht il-bahar iccelebrajna” – Alvin Livori u Kerstin Fenech with Dreamteam Carnival Company in the Triumphal Floats section, and by “Masquerade” – Joseph Abela & Friends, Ghaqda Marija Annunzjata Hal Tarxien in the Dance Companies section. Overall winner was “Masquerade” – Joseph Abela & Friends, Ghaqda Marija Annunzjata Hal Tarxien. The Carnival Organising Committee thanks participants, the Police Corps, Transport Malta, the judging panel and all those who participated in this year’s Malta Carnival programme. The Committee announced that Malta Carnival 2017 will be held between Friday 24th and Tuesday 28th February, 2017.